Hungry? 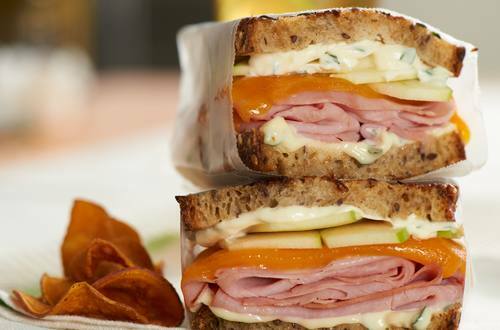 Our easy grilled country ham and cheese sandwich recipe is the key to a happy, full stomach. Warning: your whole family will want a bite! 1 Combine 2 tablespoons Hellmann's® or Best Foods® Real Mayonnaise with thyme in small bowl. 2 Evenly spread mayonnaise mixture on bread, then evenly layer remaining ingredients on 2 slices. Top with remaining bread slices. Spread remaining 2 tablespoons Mayonnaise on outside of sandwiches. 3 Preheat grill pan or 12-inch nonstick skillet over medium-high heat and grill sandwiches, turning once, until golden brown, about 8 minutes.